We’re feeling much less soggy this week, now that summer truly has begun! Nice hot days and plenty of sun are good for our warm-weather crops like cucumbers and squash (which will be ready very soon). The tomato plants are also thriving in hot temperatures – they look great, and are ready to be trellised. That will be the big project this week, along with completing a back log of planting and seeding that was delayed by the rain. Nick’s parents are staying with us for a few months and helping out on the farm and with the new baby. They are hugely helpful, and have taken on the chicken and turkey chores, as well as helping weed and harvest. Scott, Nick’s father, is also helping me staff our stand at the Glenview Farmers Market on Saturdays. We are one of two Certified Organic produce vendors at that market, and folks there seem very happy to have us! Nick has been making room for the chicken and turkey pastures in the field this week. This picture shows two portions of field: the right-hand side was our winter chicken pasture, and the left-hand side was cover-cropped in rye last fall. Notice all the weeds to the right? 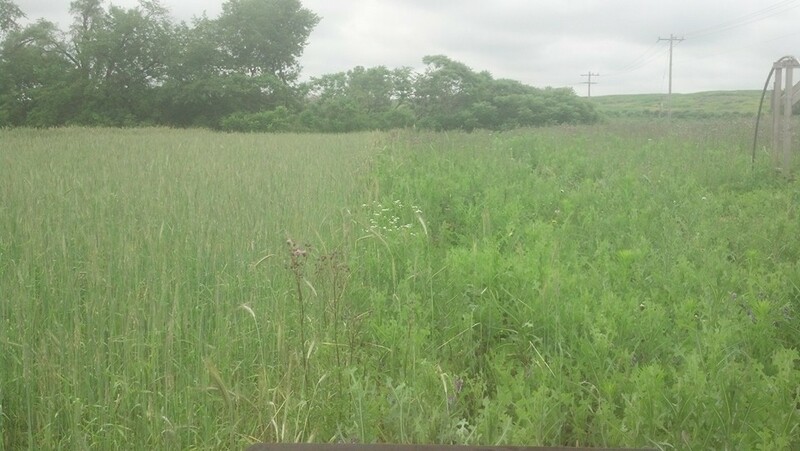 The cover crop on the left choked many of the weeds out, making them unsuccessful and unable to set seed. Nick can mow this field for the chickens to use this year, and hopefully when we plant in it next year our weed load will be greatly reduced! Cover cropping is a practice that is encouraged under national Organic standards. Here’s proof that it works – no herbicide needed! 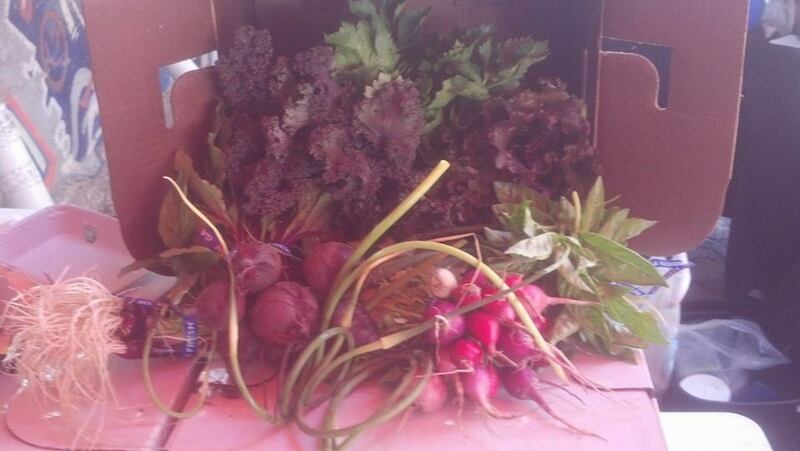 Remove the radishes and beets from their greens to store. Don’t forget to keep the beet greens! Store radishes in a container of water to keep them crisp. Garlic scapes store for a long time in the fridge in a paper bag. Basil can be placed in a jar or cup of water like a bouquet and stored on your counter top. If you want to store it in the refrigerator, wrap it in damp paper towels, place in a plastic bag, and store in the refrigerator door where temperatures are warmer. In Europe, people enjoy their radishes sliced thinly and layered on good buttered bread. The celery in your box is young and has a concentrated flavor that is great in cold salads, soups or stews. You can also use the celery leaves as the base to a simple salad – add shaved or grated hard cheese or bleu cheese, nuts, and lemon-juice vinaigrette. Use red bunching onions wherever you might use green onions – they have a similar taste to green onions and they pretty up cold salads like tuna or egg. Garlic scapes are the flower stalk of the garlic plant. Use the green part of the scape (discarding the dry, brown tip) where you would use regular garlic. (Thursday) Napa cabbage (or Chinese cabbage) is a delicious, but under-appreciated, vegetable. Be sure to wash the leaves well by swishing vigorously in cold water before use. Napa is great in salads (try Lori’s recipe below, or this recipe for napa salad with ramen noodles). You can also make kimchi or roll-ups! (Sunday) Beets can be boiled, roasted, used in soups and stews, and even shredded and eaten raw! This is the easiest preparation I know: scrub them well and wrap them in tin foil. Roast in oven at 375 until tender, 30-45 minutes. The skins should slip off. Slice and serve warm with butter or cold with olive oil vinaigrette. Beet greens are much like chard and can be prepared in the same way that you might prepare other greens. There are so many different ways you can make pesto. You can use almost any green veggie/herbs and nuts! Pesto is great on pasta, rice, veggies, sandwiches. Pesto can be frozen for later uses. Try freezing them in ice cube trays for single portions (after frozen place the cubes in a freezer bag or container). Toast raw almonds on stove-top over medium-low heat until slightly toasted (you should be able to smell their fragrance in the air). Remove from heat and allow to cool. In a food processor, combined toasted almonds, garlic, and lemon zest. Process until roughly chopped. Into a blender with the motor running, add the garlic and pulse until finely chopped. Add all of the herbs, cheese, pistachios, salt, and pepper to the blender, and blend until finely chopped. With the blender running, add the olive oil in a steady stream until the mixture becomes creamy and emulsified. Blanch kale in a large pot of boiling salted water, about 1 minute. Drain and rinse with cold water to cool; wring dry in a clean kitchen towel. Transfer to a food processor, add garlic, Parmesan, and walnuts, and pulse until coarsely chopped. With motor running, add oil in a steady stream and process to a coarse purée. Add lemon juice and season with salt and pepper.